The Georgian Bay Littoral (also called the Georgian Bay Biosphere Reserve) is a UNESCO Biosphere Reserve located in Ontario, Canada. 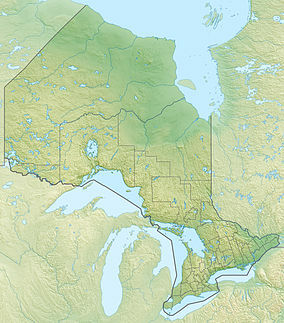 The biosphere was the thirteenth in Canada, and covers the Thirty Thousand Islands area of eastern Georgian Bay, one of the world's largest fresh water archipelagos. ^ "GEORGIAN BAY LITTORAL". UNESCO - MAB Biosphere Reserves Directory. UNESCO. Archived from the original on 26 November 2010. ^ "MINISTER DION WELCOMES THE DESIGNATION OF CANADA'S 13TH BIOSPHERE RESERVE" (Press release). Government of Canada. 4 November 2004. Archived from the original on 26 November 2010. ^ "UNESCO Protects 19 New Biosphere Reserves" (Press release). Environment New Service. 2 November 2004. Archived from the original on 26 November 2010. This page was last edited on 5 April 2019, at 21:16 (UTC).